New painting that I just did today. Ever since I was a college art student about 32 years ago I’ve painted tightly. I couldn’t get away from natural tendencies to paint tight. I wasn’t very expressive in my use of paint. I only painted occasionally after I graduated and never really developed as a painter. There were periods when I stopped painting all together. My job and family kept me busy but after my daughter graduated and went off to college I found the time to get back into painting. The type of painting that I liked had also evolved during that time. When I was an art student/young artist my favorite artists were Rembrandt, Vermeer, Michaelangelo and Andrew Wyeth. Now the artists that I really like are Picasso, Modigliani, Van Gogh, Edward Hopper, and Diebenkorn. We had a really good model at today’s life drawing workshop. I did a couple of profile portraits of her. I felt good about the drawings but not too much about the likeness. 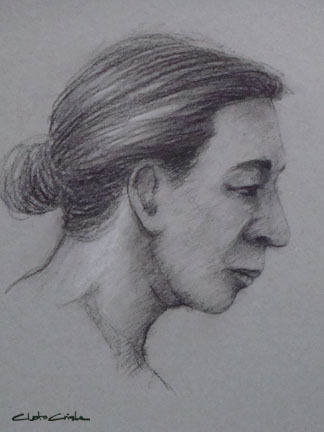 Most times I can get a good likeness of a person but capturing the essence and personality that gives the portrait drawing a sense of presence of that person sometimes eludes me. Maybe for this model I didn’t get her eyes done right. That’s what I need to concentrate on at the next workshop. Not that I didn’t try today. I know I was fussing about it a bit but that’s why I attend these life drawing workshops. All these drawing sessions surely must help improve my craft. 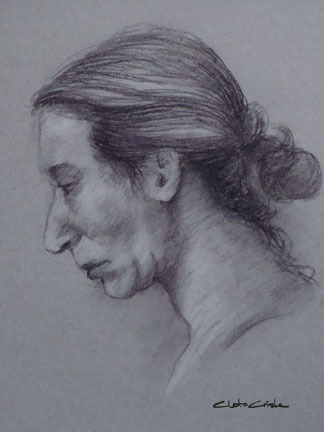 Charcoal on toned paper with white highlights – 20 minute pose.